Flickr photo by nicholas.blah used under the Creative Commons license. I’ve recently spent 27 hours in the air, something I do on a relatively regular basis, so I think I’m well qualified to weigh in on airline food for the long-distance traveler. It’s horrible — no surprises there. But what’s to be done about it? In the days of People Express (remember the low-cost, no-frills, no-food airline of the go-go ’80s?) I used to brown bag my own sandwich, fruit, and nuts for a cross-country trip. I gather that in these cost-cutting days, with “free” in-flight meals a thing of the past on most domestic carriers, edible offerings can be had — for a price — some developed by celebrity chefs no less. But on a recent trip from San Francisco to Sydney, which leaves around 11 p.m., I just didn’t eat. I don’t get hungry in the air these days. In part that’s because I’ve developed a debilitating flying anxiety disorder over the past decade or so after years of winging my way across the Pacific Ocean without a care in the world. Folks who similarly suffer in the skies know just how crippling flight anxiety can be. Yesterday I had a full-blown panic attack, complete with whole body shaking, as I white knuckled my way through 90 minutes of turbulence thanks to a tropical storm off the coast of Australia. When the attendant told me to expect more of the same — and worse — in our approach to San Francisco (the day after the biggest deluge in the city’s past 50 years or so) I cried. Flight anxiety is irrational, embarrassing, and exhausting, especially on a long-haul journey. If you’ve been there, you know what I mean. It’s also a total appetite suppressant. Probably just as well, given what was on offer in the cabin. Was that weird yellow goo resembling glue really eggs? And what was that mush underneath? Surely not potatoes. I usually stick to the yogurt and fruit plate but on the leg into Sydney the fruit was warm, ditto the orange juice. One sip and i almost threw up — and not from nervousness. I stopped bothering to request a vegetarian meal ages ago, since the veg trays were comprised of dishes as dry as cardboard and who needs to get even more dehydrated at 35,000 feet? This very funny letter sent to Virgin’s Richard Branson earlier this year about a hideous dinner served in-flight from Mumbai to Heathrow makes me think that this is a global phenomenon for those of us who fly cattle class. Is the only answer to bring your own chow for overseas trips so when you hit that cruising altitude you’ll have something edible to eat while you watch movies you’ve already seen and can barely hear, wincing in your seat at every bit of bumpy air? Ah, the glamor of international travel. Yes, please bring your own food. The airlines simply cannot afford to spend any extra $ on food. They are all (United, especially) just trying to stay afloat. Are you aware that most airline employees took a 35% pay cut? United Airlines employees lost most of their pensions. I cannot think of another business where costs (fuel, security, insurance) go up and prices (fares) go down. Thanks for the insights on the inside. You make some valid points. From the minute I buy my ticket I start thinking about what food I will bring for myself on the plane. I am a sucker for bringing homemade veg sushi and bento boxes. A good sandwich or two has also never done me wrong. A crackin’ piece of fruit or two or three will make seat mates blind with envy so bring some to share. I find that the comforts of my own food lessens the anxiety. The last time I flew without my own food, I was on my way to Berlin from Seattle. I was so crippled with fear that I had to call my ex from Chicago, sobbing all the while of course, so that he could coax me into getting on the next leg of the flight. Reason number 5 million and 1 — long distance relationships don’t work…. Hope you are well and safely at home! Good suggestions and sound advice, Nicole. I’ll follow suit on my next trip. Very eloquently written Sarah! I have, over the years, come to “enjoy” airline food (I’m a QANTAS gal), mainly to pass the time, and perhaps vaguely because I’ve inherited my mother’s legacy of eating everything on the plate….and that of your children, not necessarily to avoid wastage, but to give you something slightly physical to do!! Sad but true. And yes, that yellow glue is eggs – frightening, isn’t it? Thank you, Karen. And I hear you on the boredom eating front on those long haul flights…just would be nice to be nibbling something delicious to pass the time, don’t you think? I’ve never carried my own food on board, but would be very glad to try it – are there ever any issues with getting it through the security checks, though? I requested low fat meals once, which were the most inedible things imaginable – think steamed chicken breast with steamed white rice. That’s it! No sauce, no flavor, not even vegetables. At least they worked in that there was not only low fat, there was NO fat ingested because I couldn’t eat them. 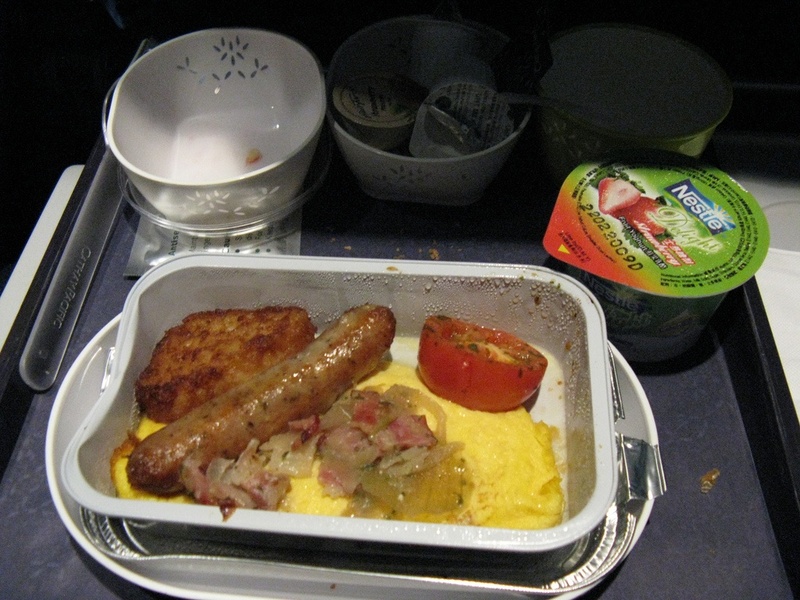 Now, I usually don’t eat at all on board, no matter how long the flight. Dionne, what’s happened to UA employees is simply terrible, and I hope the airline can fight its way back out of it. But the fact is, if you’ve paid for a seat then you’re a customer, and expecting paying customers to bear the brunt for decades of bad management decisions through poor on-board amenities, clearly unhappy staff etc., strikes me as not a great long-term strategy for ensuring repeat business … I now have UA on my ‘Will never travel under any circumstances’ list of airlines, unfortunately. Well said, JCN. As for bringing food on, I’ve never had a problem. But sometimes I forget to ditch the fruit & veg before the sniffer beagles come out and make a beeline for my baggage! I typically eat before I get on the plane. If I do bring food on it’s likely to be trail mix, dried fruits, crackers, nuts, lots of nuts to keep me sane. I don’t know if it is still the case, when I was traveling to London every month in 2002-2003, I flew on Virgin Atlantic. They fed you the entire trip and the meals and snacks were excellent. Things like Hagan Daaz ice cream bars, vegetarian curry dishes over steamed rice, very good chicken pasta dishes. I know it sounds weird to say that I’ve had a good experience with airline food, but it’s true! Sadly, I can’t say the same for other airlines. I’ve flown first class on Continental and United, and even Virgin Atlantic’s economy class beats those airlines’ food experience! Yes, I’ve heard good things about the food on Virgin too…and QANTAS, Singapore, Emirates…Just once I’d love to do that 13-hour flight on an airline that serves fab food in first-class — and gives me a bed!